It is more economical to repair your Stuart Turner water pump than to buy a new water pump that may cost you anywhere between €700 to €1200 for the pump and the installation of the pump. It will not make a difference if you have a positive head or negative head pump once your pump is a brass twin Monsoon or Stuart Turner it can be repaired. These pumps can easily be repaired in your own home and take less time to repair than installing a brand new expensive water pump where pipework may need to be altered. Stuart Turner water pumps are built to last and have gained a great name in the pump industry for manufacturing solid well built pumps. However nothing lasts for ever and your pump will most certainty need replacement parts after eight to ten years which is not bad at all. We can repair almost any fault on a Stuart Turner pump once the motor is in working order. The older type Stuart Turner pumps were built using Brook Crompton motors which are the green motor and used on pumps manufactured before 2009. In our opinion these motors are one of the most solid motors built and may last for years. Its not uncommon for the brook Crompton motors to be still running after 20 years of daily use. You cannot repair a motor you simply replace the parts on the pump only. All the pumps built before 2009 will have this green motor and all can be repaired. Stuart Turner Monsoon negative and positive head pumps. Stuart Turner universal negative and positive head pumps. ST55 and ST66 shower booster pumps. Stuart Turner 1.5 Bar Pumps 2 Bar Pumps and 3 Bar Pumps. Stuart Turner M330N Negative head brass pumps. 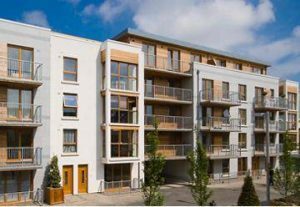 All the above pumps are used in apartment blocks to booster water from the main water tank in the apartment. They are also used in houses to boost water to showers and bathrooms. All monsoon and universal pump repairs. PCB & start capacitors replaced. Pressure vessels / pressure switched replaced. All repairs carried out are done with new parts on all repairs. Always ensure your pump repair is done with brand named parts. 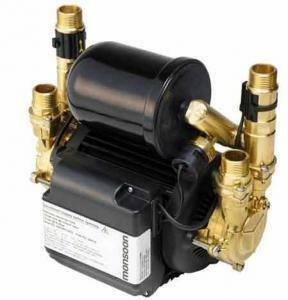 The Monsoon Universal 2.0 bar negative head Twin pumps are designed for full installation into a vented system to pump and boost both the hot and cold water supplies in apartments and houses. The Monsoon negative head pump is designed for both positive head and negative head systems and contains a pressure vessel.